Donald Esarove, age 85. Loving husband of 59 years to Anne (nee Stiles); dear father of Brad (Kelly), and Elizabeth Anderson (Brian); grandfather of Katie, Meghan, and Brock Esarove and the late Brittany Anderson; brother of the late Arthur; and uncle of Mark Rieck. Donald was the president and owner of North Coast Industries and owner of Riley Gear and M.P.I. He was the proud founder of NEOIBN from which he was given the Keys to the City of Cleveland in 2016. Past Commodore of the CYC and active member of Rocky River U.M.C. 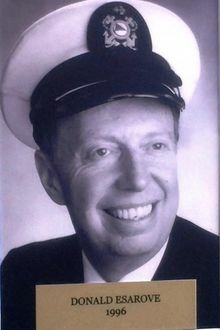 Donald was passionate about family, business, and sailing on Sloopy. Memorials may be forwarded to Rocky River United Methodist Church or Hospice of the Western Reserve, 17876 St. Clair Av​​e., Cleveland, Ohio 44110. Funeral service will be held on Saturday January 5, 2019 at 1 PM at Rocky River United Methodist Church 19414 Detroit Rd, Rocky River, OH 44116.